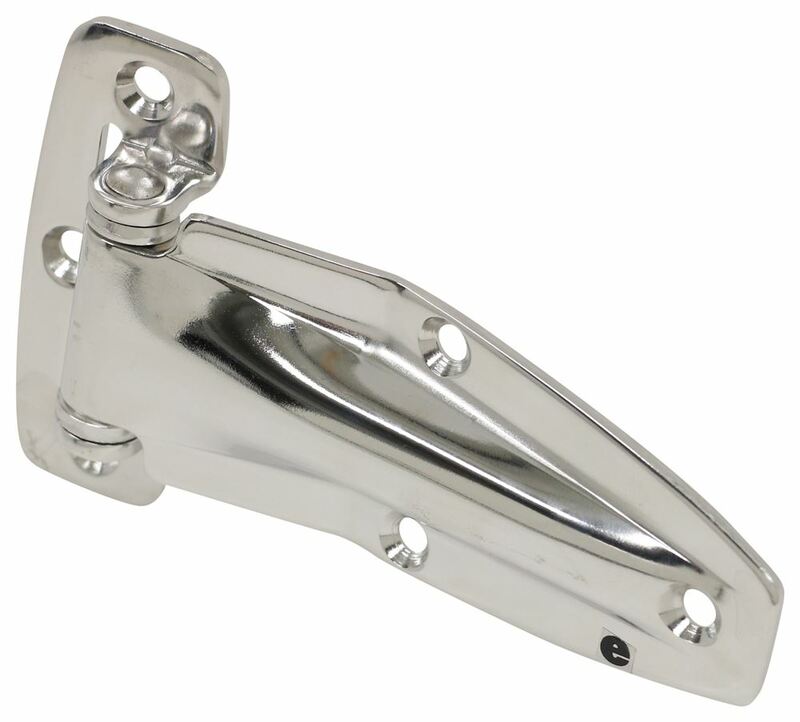 Call 800-298-8924 to order Polar Hardware enclosed trailer parts part number PLR104SS or order online at etrailer.com. Free expert support on all Polar Hardware products. 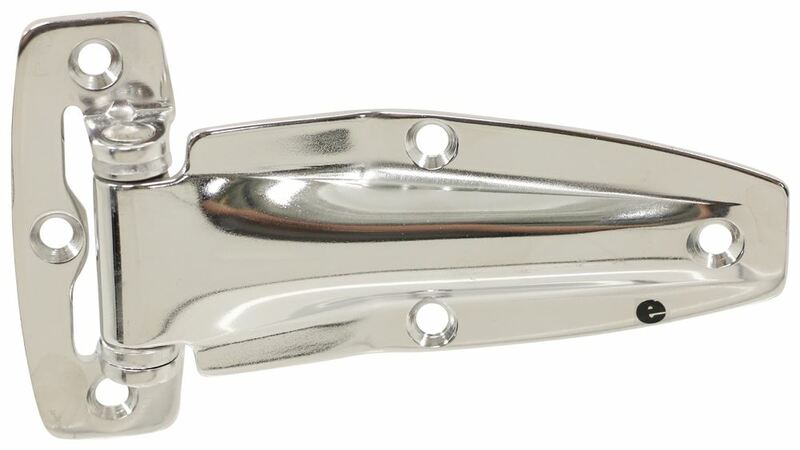 Guaranteed Lowest Price and Fastest Shipping for Polar Flush Hinge - Stainless Steel. Enclosed Trailer Parts reviews from real customers. Speaker 1: Today we're taking a look at a Polar Flush Hinge. 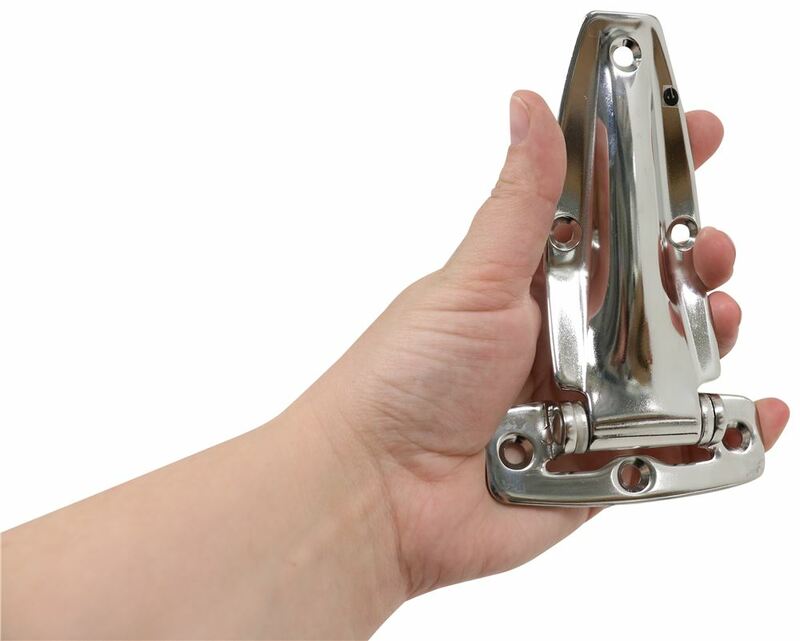 This hinge is for use on cabinets, service vehicles and utility trucks. It revolves on nylon bushings for nice, smooth operation and it's made from stainless steel so it's very strong and durable and does a great job at resisting rust and corrosion.The holes are all drilled out and counter sunk for number 10 screws, which are not included but it does contain a total of six mount holes.The overall length of the unit when it's laying flat like this, so from the very back of the base to the very end of the strap, that gives us a measurement of around five and a half inches long. The base of the hinge measures, three and one quarter inches long by about one and three-sixteenths inches wide.I also took a measurement from the center of the connection point right here, to the very end of the strap. And that gives us a measurement of about four and nine-sixteenths of an inch, to four and five-eighths inches right in that area.At the widest point of the strap, which is this point here at the back. That measures one and fifteen-sixteenths of an inch wide and it tapers all the way down to seven-eighths of an inch wide.The strap holes, this one and this one are separated on center, by one and three-eighths of an inch. And then from the center of these, going straight out to the center of this hole is about two inches.The base holes, this one to this one, separated on center by two and nine-sixteenths of an inch. If you we're to take a straight line, between these two holes and measure straight out to this one, that would give you a measurement of about three-eights of an inch.That's going to do it for today's look at the Polar Flush Hinge. 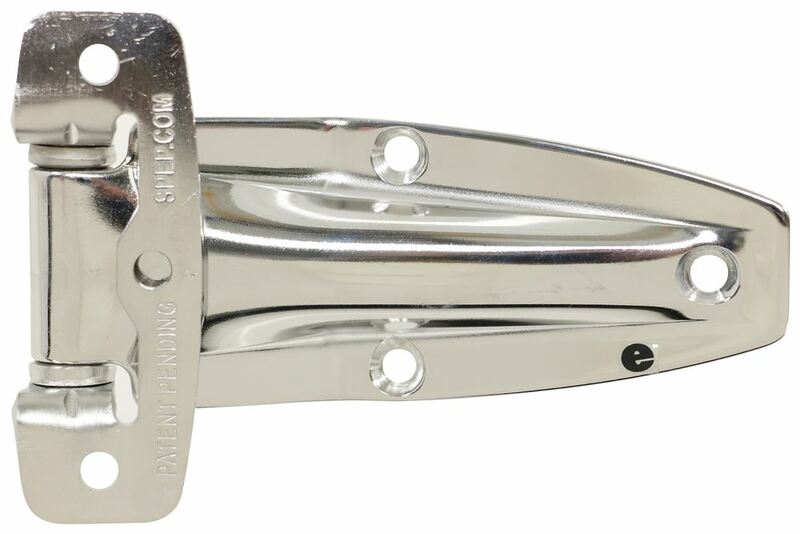 The Polar Flush Hinge - Stainless Steel # PLR104SS is 5-1/2 inches long. The base measures 3-1/4 inches long by 1-3/16 inches wide. The holes are countersunk and drilled for #10 screws which are not included. I've attached a video to further help with dimensions. 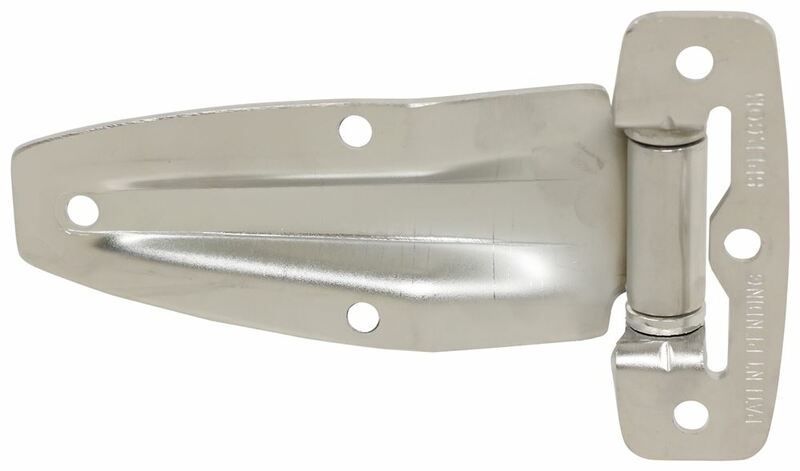 The Polar Flush Hinge - Stainless Steel # PLR104SS will work well to replace hinges on trailers. I've attached the dimensions of this hinge to assist. You will need to check these measurements against your 1978 Triple E Surfside camping trailer to determine if it will fit as desired. This hinge has holes drilled and counter sunk for #10 screws. We do ship to Canada. The Polar Flush Hinge - Stainless Steel # PLR104SS is not rated for a specific weight because you can simply add more hinges as needed to support the weight of the door. The screws used and the door material will greatly impact the weight capacity.